Addons do not stand still and are constantly evolving, but this type of addon is still quite limited compared to modifications. 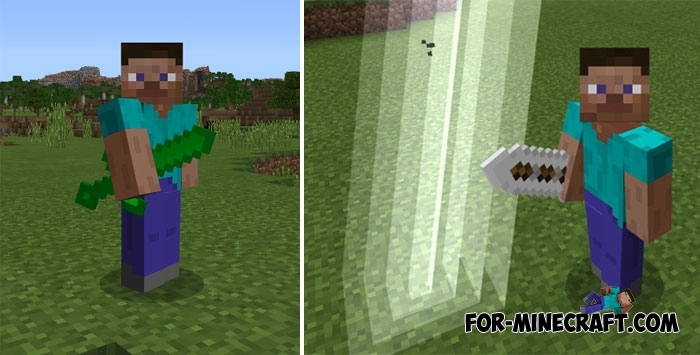 But even so, the creators of addons manage to create something unique and useful for Minecraft PE, including new weapon addons. Sword Pack adds 5 magic swords that outperform the original ones. Each sword has its own name and a number of characteristics used in battles. For example, a thunder sword is able to summon a lightning bolt and practically charge opponents, but that's not all, since the swords have several features at the same time. Creeper Sword like a creeper is an explosive object. This sword creates an explosion at the point of hit, and also speeds up the player a little. Test each sword and evaluate their abilities (all swords are available in the creative inventory). How to install the Sword Pack addon? Blood Magic PE mod (MCPE 1.1)You get altars, magic sigils, a knife for sacrifice, weapons and armor, alchemical blocks, new recipes and much more..